Many practical technologies have been developed in the area of spatial audio since the last international conference in Tokyo, AES International Conference on Spatial Audio —Sense the Sound of Space—, was held in 2010. We have managed to handle the technology and used it to create countless works since then. In the light of such technology-driven content creation, it may be the time to address ourselves to the aesthetics in audio production. How can the Spatial Audio technology contribute to music and other artistic productions? What technologies and scientific knowledge are expected from musicians and the content creators? What are the keys for connecting Science and Aesthetics in this area? 25-minute slot including 20-minute presentation and 5 minutes discussion for one author. 90-minute slot for one category. 15-minute slot including presentation and discussion for one author. 60-minute slot for one category. From 60-minute to 120-minute for one session. 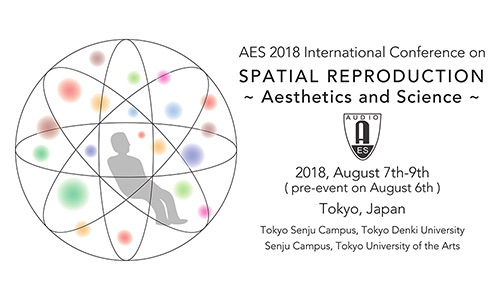 Workshops are chaired by Akira Nishimura and Shiro Okada ( 2018spatial_workshops@aes.org ) and proposals are to be submitted to them by e-mail. For the complete-manuscript peer-reviewed papers, authors are asked to submit papers of 4–10 pages to the submission site by 2018 January 5. Papers exceeding 10 pages run the risk of rejection without review. Papers should be prepared using the supplied template. You can download these using the link on the submission form or from the Templates menu. These complete-manuscript papers will be reviewed by at least two experts in the field, and authors will be notified of acceptance by 2018 February 9. If rejected as a paper of Cat. 1, the proposal may still be accepted for Cat. 2 or an engineering brief. For abstract-precis-reviewed proposals, a title, 60-to 120-word abstract, and 500- to 750-word précis of the proposed paper must be submitted by 2018 February 9. Authors will be notified of acceptance by 2018 March 9, and the authors must submit their final manuscripts (4 to 10 pages) before 2018 April 6. Papers should be prepared using using the supplied template. You can download these using the link on the submission form or from the Templates menu. If rejected from this category, the proposal may be still be accepted as an engineering brief. For engineering briefs, authors must supply a title and synopsis to the submission site by 2018 March 16. Topics for the engineering briefs can be wide-ranging. Relaxed reviewing of submissions will consider mainly whether they are of interest to AES conference attendees and are not overly commercial. Authors will be notified of acceptance by 2018 April 6, and PDF manuscripts of 1–5 pages following the prescribed template must be submitted by 2018 April 27. Workshops and tutorials should be submitted as a title, chair, presenters (panels), abstract, précis and equipment requirements. Authors are encouraged to submit proposals directly by email to the workshops chairs (address above) by 2018 January 5. Acceptance of workshops will be notified by 2018 February 9. If a paper is longer than 10 pages, the author will be charged a fee of $25 for every page over 10. Papers will be published online in the AES E-Library no earlier than 10 days before the event. At least one author of each contribution must pay to register for the conference and attend the conference in order to present, or it will not be included in the proceedings. Any author wishing to attend the conference must pay the registration fee.